But there's more to Nick, and to his house, than meets the eye, and soon Frank realises she isn't the only one keeping secrets. Or the only one who needs help. One of the good things social media does is highlight important issues. This week it's #AntiBullyingWeek where we're celebrating what makes us All Different All Equal. 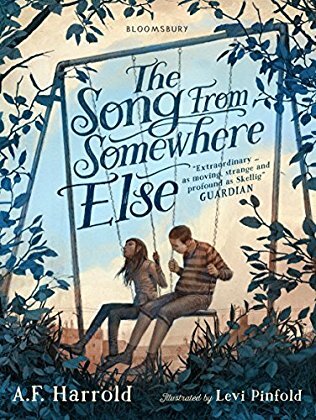 The Song from Somewhere Else by A. F. Harrold is the exact book that covers this topic in a clever and unique style. The book was published on the 2nd November 2017 by Bloomsbury. When you turn the book cover, you will be greeted with Levi Pinfold's amazing illustrations. He has done a sublime job of interpreting the story and creating the mood that the plot encapsulates. Levi delivers a FANTASTIC balance of brooding charm that manifests through the illustrations; a CREEPING darkness with a blend of solitude in a black and white world. This is a clever feature that makes the book stand out from the crowd. It is a book that should be bought and read. When the first page is turned, you are already on the backfoot as the narrative draws to the loss of the main character's pet cat, Quintilius Minimus. This leads the reader down a wildly imaginative plot that is equally heartbreaking and uplifting. The story engages the reader with the theme of bullying - it is the driving force of the narrative. The developing friendship between Frank and Nick is deeply moving. Their worlds crash together in an atmospheric tale of difference and isolation. The book explores deep inside the workings of a child covering loss, friendship, betrayal and family life. This is intertwined with another plot that is so far removed from reality. It is a fantastic blend of fantasy involving a Troll and shadow type stick men. I loved Frank, the main character, she had an internal dialogue with her stomach depicting her feelings and emotions. I found this refreshing as it delivered a naivety and really highlighted the character's perspective and thinking. This is a brilliant read that covers a really serious issue that many kids will be facing today. The story gives readers hope. In the face of adversity, courage and brave actions that lie within the story, give us inspiration and make the book a very special and poignant read. This is a brilliant book that will make you think on your magical fantasy feet - so flex those toes and give it a read.